Nowhere in the official billing for this event did the word “hustings” appear, but it had the distinct feel of just that. Conservatives gathered in a room in Parliament dripping with history, to talk about the future. The wallpaper in the Jubilee Room was designed by a bloke who died in 1852 – Augustus Pugin. The people there had designs on the 2020s and beyond. And, perhaps, on leading us into that decade. This was a gathering organised by the Tory think tank Onward – which presented research concluding that age is the new dividing line in British politics and the Conservatives are appealing to fewer and fewer younger people. Onward’s report said 83% of Conservative voters are now over the age of 45 and just 4% are under the age of 24 years old. “The ‘tipping point age’ – the median age at which a voter is more likely to be Conservative than Labour – is now 51 years old, up from 47 at the 2017 general election. “Before the 2017 campaign, the tipping point was 34 years old,” it adds. Who could replace Theresa May as leader? The brand is so toxic among many younger women, the organisers said, the party did not even “pass rudimentary hygiene” tests for them. Add to that, they said, the UK was urbanising, and people who moved to cities tended to become more left wing, “shifting the soul of the Conservative Party from Kensington to North Yorkshire”. Among those listening to the presentation are two cabinet ministers, teased by everyone else as leadership contenders when Theresa May stands down as prime minister. 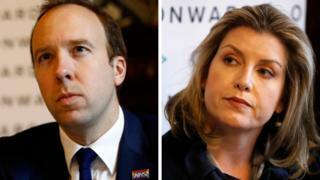 When the words were uttered, there was the odd awkward shuffle or looking down at notes from International Development Secretary Penny Mordaunt and Health Secretary Matt Hancock. And both agreed the central conclusions of the research amounted to a “kick up the arse” for the Conservative Party. 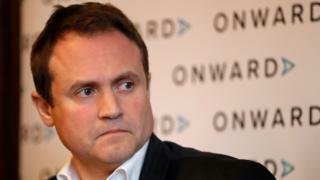 Incidentally, the chairman of the Foreign Affairs Select Committee, Tom Tugendhat, was also on the discussion panel – although he suggested others were contenders rather than him. The pitch from Mr Hancock, who voted Remain, but said Brexit had to be delivered, went like this: “I’d like to change the subject. “We need to talk about everything else. Not just Brexit. We need to look and feel like a party that is a champion of modern Britain. Yes, Brexit was the elephant in the room, acknowledged as it had to be, while it was universally hoped that one day, eventually, it might be possible for politicians to actually talk about other stuff. Environment Secretary Michael Gove had hoped to do just that here, but pulled out at the last minute because, you guessed it, he was negotiating with Labour about Brexit. Ms Mordaunt voted Leave, but went out of her way to appeal to some who had voted in the opposite direction to her: “Those who, in my view, showed the greatest act of patriotism over the last few years weren’t Leave voters. “It was Remain voters who accepted the result. Classic signs of the contest to come were there to be witnessed. Mr Hancock appeared to address the camera at the back of the room, rather than those of us gathered within it. Ms Mordaunt started her spiel with the story of Femi, a disabled computer coder, aged 11. A classic of political communication – grounding a message in the story of an individual they have met. This was a party asking serious questions about the future, and its place within it. But it also amounted to this: pre-season training for the competition to come. The first evidence, in public, of the contest that awaits us. The battle to be our next prime minister.